When the Second World War began Britain was faced with the need to increase home food production and the area of land under cultivation had to be increased significantly. The Minister of Agriculture and Fisheries set up County War Agricultural Executive Committees ('County War Ags') to oversee this increased food production. They had powers to direct what was grown, to take possession of land, to terminate tenancies, to inspect property, and to organise mobile groups of farm workers. One of the first tasks was to direct a ploughing-up campaign with large expanses of grassland being prepared for cultivation and instructions given as to what should be planted. To assist in this campaign, a preliminary farm survey was started in June 1940 and farms were classified A, B, or C, depending on their productive state (ie. the physical condition of the land) and the managerial efficiency (or otherwise) of the farmer (in extreme cases land was taken over by the local Committee). The War Ag instructed farmers to plough part of their land and plant alternative crops, as can be seen in the extracts below. produced long stems which caused problems at harvest. difficult to harvest and was trialled for one year only. 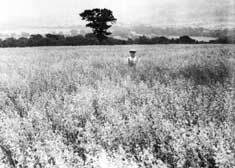 Having reached their initial goals, the Ministry of Agriculture and Fisheries then started a 2nd survey to be used in forward planning, which like Domesday would provide a "permanent and comprehensive record of the conditions on the farms of England and Wales". The National Farm Survey undertaken by district committees consisting of experienced farmers, and was begun in early 1941 and completed by the end of 1943. Every farm and holding of five acres or more was surveyed in addition to the information already gathered in a census return of farms completed by the farmers on June 4th 1941, which had included crop acreage, livestock numbers, information on rents and their length of occupancy. The records created by the inspectors for each farm included information on the conditions of tenure and occupation, and the general state of the farm including its fertility, adequacy of equipment, water and electricity supplies, weeds or pest infestations, and general management. A map showing the fields and boundaries for each farm was also produced. View a complete transcript of the National Farm Survey for Malhamdale, complete with maps. This extract shows some of the details recorded for the farms in the township of Kirkby Malham, taken from both the farm census return and the inspector's report. These are available at the National Archives in the record series Kirkby Malham MAF32/1144/459/1-8. The entries in red show the land ploughed up and planted under the direction of the County War Agricultural Executive Committee. A more comprehensive Research Guide with details of the National Farm Surveys can be downloaded from the NA website. Searching the National Archives Catalogue you will find the records listed for the other townships under these references.